Miso-Glazed Tilapia with Roasted Bok Choy is so easy and so flavorful! You’ll want to use the miso glaze on everything! Post may contain affiliate links. 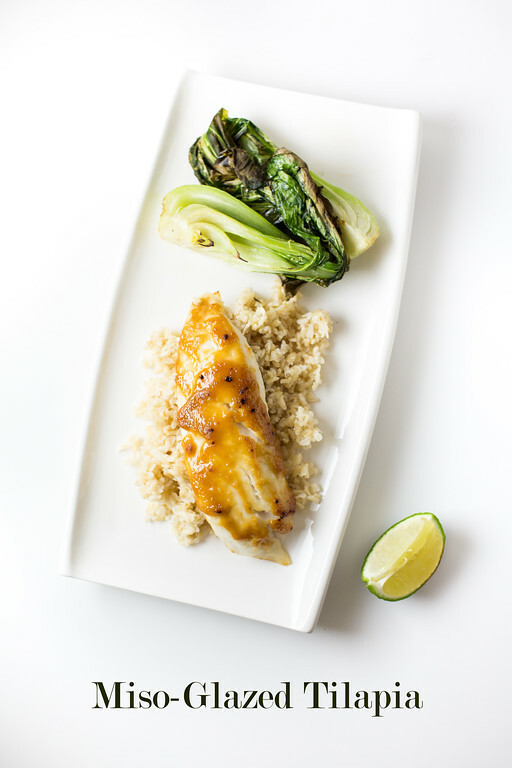 Miso-Glazed Tilapia with Roasted Bok Choy. What’s your fish of choice? I have to say that I cook primarily with Salmon or Tilapia. Salmon for it’s rich, meaty goodness and tilapia because it’s so mild and is the perfect backdrop for whatever flavors you want to pair with it. I love buying big bags of tilapia at Costco and then spend my time googling tilapia recipes. One of my favorite tilapia recipes that I’ve tried is: Tilapia with New Potatoes and Pesto Mayo . So, after a post-holiday run to Costco, I found my self again searching for a new tilapia recipe. 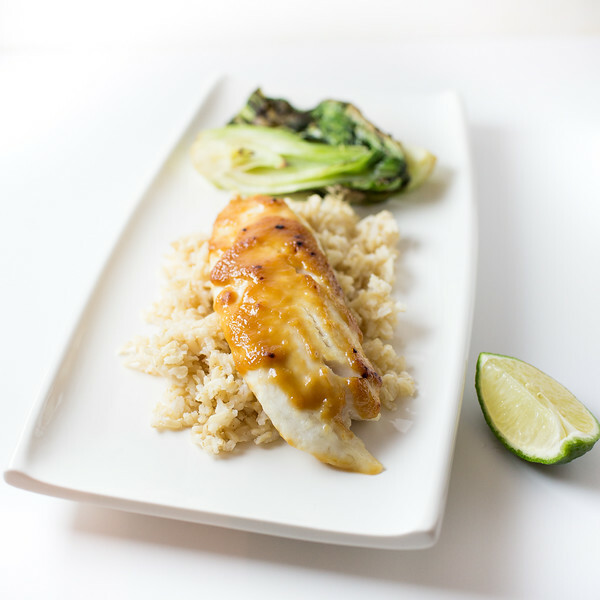 Click here to pin this Miso-Glazed Tilapia with Roasted Bok Choy now! How I Found My Tilapia Recipe. One of my new favorite ways to search for recipes is with my Texture App on my iPad. If I actually subscribed to all of the magazines that it let’s me view, my house would look like an episode of hoarders. While there are some magazines that it doesn’t have that I wish it had, like Fine Cooking, I am more than happy with those that it does have. The beauty of it is that it does a search within the app and it gives me access to back issues of magazines. So, a search for Tilapia, pulled up a Miso-Glazed Tilapia recipe in Rachael Ray’s Magazine. Even though I have seen countless recipes for miso glaze, this was the first one I actually tried. Oh my gosh, what have I been missing? This was sweet and earthy, such a complex flavor! I will be using this glaze on everything. I didn’t change a thing about it. In Rachel Ray’s recipe she calls for pan searing the baby bok choy. Since I was already using my oven for the tilapia, I decided to roast the bok choy. Again, oh my gosh! Roasting bok choy is so easy and perfect. The fleshy stems get tender and the leaves crisp up almost like kale does. The best of both worlds! This Miso-Glazed Tilapia with Roasted Bok Choy is easy, healthy, and delicious! Preheat oven to 450. Place the bok choy on a baking sheet and drizzle with oil, grated ginger, and garlic and season with salt and pepper. Roast for 10 minutes, then turn over and roast for 5 more minutes. Remove from oven, drizzle with the sesame oil and keep warm. While bok choy is roasting, place tilapia filets on a foil lined baking sheet. Combine the miso, lime juice and brown sugar in a small bowl and spread on both sides of fish. After removing the bok choy from the oven, turn on the broiler and place fish in the oven. Broil for about 7 minutes or until fish is cooked through. Serve with cooked brown rice and the lime wedges. Miso is one of my favourite things as the flavour is so complex. I’ve never seen tilapia for sale but I’ll try this with cod. This looks so pretty too! This sounds delicious, that miso glaze must be tried… My favourite fish is hands down mackerel, I love the stuff and would eat it much more often than I do if it were available here without a road trip to a city to get some. Delicious for a quick family meal and lovely to serve for guests. Miso glaze over fish is fantastic! I’ve had a similar meal with chicken, but I think I prefer the fish! I’ve been reading that we have tilapia here in Queensland (the state above mine) where it is considered a noxious pest and it is illegal to catch and release or eat it. If caught it is supposed to be buried above the high watermark. Go figure. I’d probably use ling for this recipe. This sounds and looks amazing. I must say, your pictures are simply amazing!!! Unfortunately we don’t have a Costco in my neck of the woods. I’ve seen packages of Tilapia at Sam’s Club but haven’t been able to bring myself to try it. Actually, I have never had tilapia, ever!!! You may have just tempted me, Pam. I love the notion of Miso glazed Tilapia and roasted bok choy oh my word! I love roasted veggies but have never tried bok choy. I’ll be changing that for sure. Thanks for the Tilapia tip Pam. I’m always looking for new fish to try. I checked out that app. I don’t have an iPad but it says it’s good for an iPhone too. We don’t get Tilapia here although you can buy fish fillets labelled – Country of Origin= Uganda/Kenya/Tanzania. Yeah, no thanks. You can also get Basa fillets from the highly polluted waters of Vietnam. I prefer Australian sustainable fish such as flathead, snapper or jewfish (sometimes called mulloway). Flathead is the best for fish & chips using a beer batter. I think snapper and jewfish would work well in this recipe.